One of my favorite classic games from the 1980s was Choplifter. 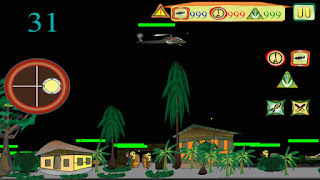 It had a smooth feel, uncomplicated controls and a simple premise: land in enemy territory and rescue hostages before the bad guys blow you up. A new mobile game called Mission-S has a similar attitude, even though the graphics and the missions are more sophisticated. In Mission-S, you pilot different helicopters through a series of more than 40 missions, each one lasting only 35 seconds. If you avoid your enemies and don’t kill civilians, you are rewarded with medals and weapons. Successful pilots also get to move up into a better class of choppers from the Hawk and Apache to the Viper. Mission-S runs on both the iPhone and iPad. You can download it for free in the iTunes App Store or in the Google Play Store.